BTB's Update information on our September Celebrations is below. American Airlines has joined the initiative by offering 20% discount form all major US hubs. Join Mrs. Kim Simplis Barrow at BTB's Gala, click the Journey Home Package button for details. Forward to all your members, family and friends!! This year, 2011 marks the 30th Anniversary of Belize's Independence and the 213th Anniversary of the Battle of St. George's Caye. 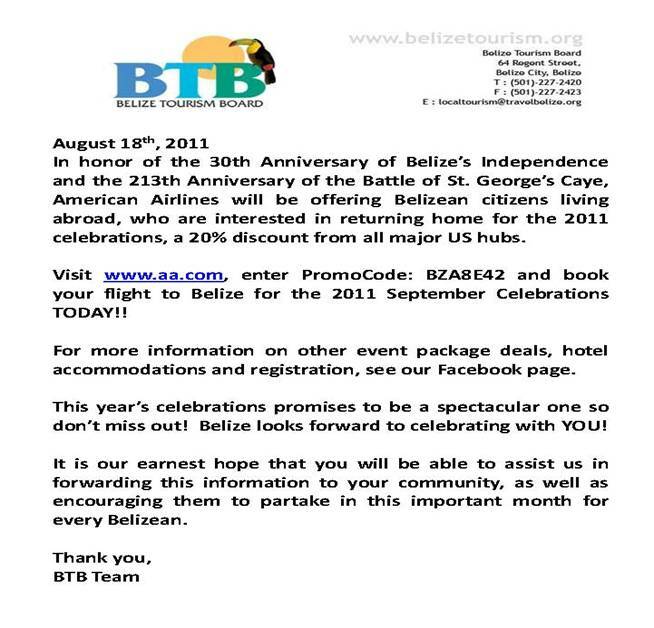 In recognition of this momentous occasion, the Belize Tourism Board has teamed-up with Delta, American Airlines & Hoteliers to offer special deals to Belizeans and their friends interested in coming to Belize for September Celebrations. 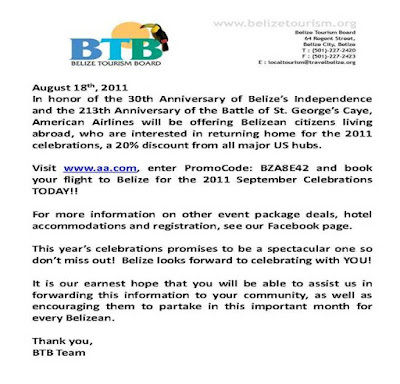 Click here to make your reservations TODAY for one of the grandest events Belize has ever seen. The BTB's spokesperson for the diaspora "Journey Home" initiative is Mrs. Kim Simplis Barrow, the wife of the Prime Minister. Click below for your personal invitation from Mrs. Barrow. Mark your calendar for the following September celebrations.